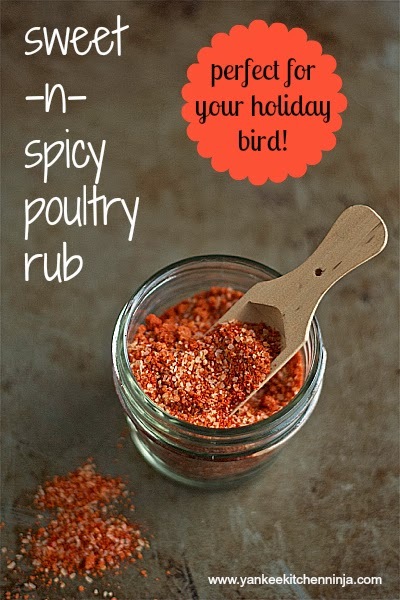 Try this easy recipe for sweet and spicy rub on chicken, turkey, steak, even veggies for tangy BBQ flavor. I've never been much on rubs. Whenever I see some kind of rub for a steak described on a restaurant menu, I think, "Meh. So what?" But, as with so many things I have discovered since I started blogging, I didn't know what I was missing. Well, maybe not on steak -- I'm still pretty much a purist in that department -- but definitely for poultry. ZOMG, peeps, this is a seriously good rub. Transformational, even. In that it transforms a simple chicken or turkey into a crispy, sweet-yet-spicy bundle of awesomeness. I don't know about you but, until I started using this rub on chicken, I never ever ever ate cooked chicken skin. Watching other people do it actually grossed me out. To me, it just was NOT something that you ate. It was merely the packaging on the outside that you removed to get to the real food. As I said, UNTIL I used this rub. The first time I baked a chicken with the rub, I took it out of the oven to cool and was intrigued by how aromatic and gorgeous the skin was. So I took a little nibble. All I can say is that if you like BBQ potato chips, you'll be in heaven. It totally tasted like a sweet, tangy BBQ potato chip. Not kidding. I actually ate all the skin off of one whole breast before the bird was even cool enough to carve. Once you try this rub, I guarantee you'll be hooked, too. Try it on stuff other than poultry, as well -- steaks or pork or even roasted veggies. I'm toying with turning it into a marinade for jerky. I can think of little that wouldn't benefit from a little BBQ potato chip flavor. 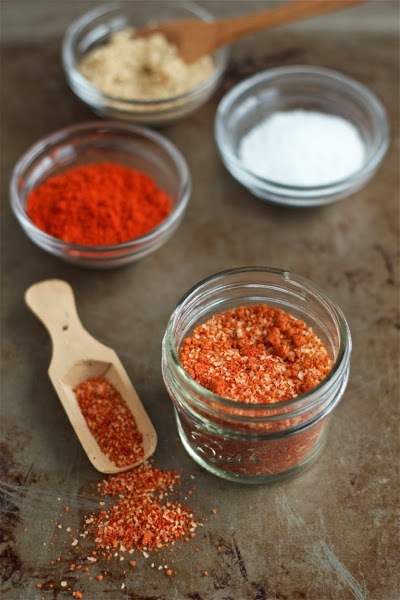 Are you into seasoning your meats with rubs? Do you have a favorite? Leave a comment: The Ninj wants to know. Combine all the ingredients in jar. Rub on meat prior to cooking or shake onto whatever you like. HA! That's what it tastes like, so I think you and Tara will love it!! I'm pretty much obsessed with spices and rubs! Am I allowed to SQUEEE when I eat this, too?? Mmm, yummy! I actually have all the igredients, I'll have to whip some up. Now if you could just come up with one that tastes like Doritoes I'd be forever in your debt.